Product #21649 | SKU 1900-030-110 | 0.0 (no ratings yet) Thanks for your rating! Unlike conventional flashlights that have a yellowish beam, Pelican Mity Lite 1900T Flashlight uses a hi-intensity Xenon lamp that produces a powerful, bright beam. Use this compact Pelican flashlight to cut through thick smoke, fog, and dust. 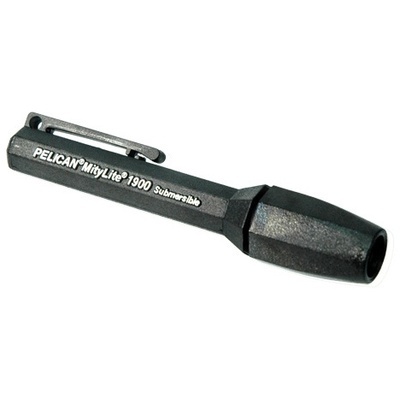 MityLite Pelican Flash Lights 1900 T are submersible to 500 feet and comes with a twist-on shroud. Pelican Xenon Flash Light MityLite 1900T-030-110 is ideal for any situation. Pelican 1900-T MityLite Flashlights are powered by 2 AAA alkaline cells. Battery Burn Time 2 hrs.